SAN FRANCISCO, CA – His 2014 hit single “You” was a nationwide success on Top 40 FM radio and his last single “Music Blow My Brain” was number one on the college radio circuit, and now rapper Bobo Norco has a new smash hit for 2015. His debut project came last year entitled “Keep it XO Mixtape” and it consisted of a dozen hard-hitting tracks including a fan favorite called “Everything”. This song has also been heard on radio around the world and the fans have been begging for it to receive more attention. 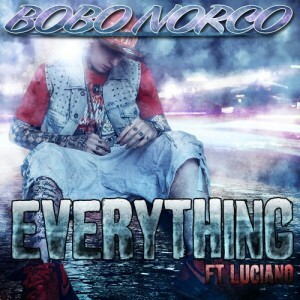 Bobo has heard his fans requests and re-released the track with exclusive new artwork and a national media campaign. The re-release of the track has gone viral on social media and has even been seen on Instagram videos by celebrity twerk instructor Lexy Panterra. Bobo Norco is coming off of the most successful year in independent hip hop history. He had two international hit singles, performed at South by Southwest, received 1.6 million YouTube views, and won several FM radio competitions against fellow big-name artists such as David Guetta and Chris Brown. Another record-breaking accomplishment was the fact that Bobo Norco was on the cover of nine magazines over a period of six months and he was in print in every major music magazine including Hype, Coast 2 Coast, AP, XXL, The Source, and The Warped Tour guide. Bobo was also an invited guest at Super Bowl XLIX in Phoenix in February and was a starting player in the official celebrity flag football game.